Whether you are a professional, hobbyist or weekend welder, the most important item to have in your possession is a quality welding helmet. Although there are many types of helmets to choose from, the safety, quality, comfort and durability of the head gear should be the leading factors in your decision of purchase. Finding the right helmet will lead to overall productivity in your welding needs and give you the satisfaction of knowing you made a great investment by purchasing a product that not only do you need, but you love! It is important that you choose a helmet that is suitable for you and your personal needs. When considering which welding helmet to purchase, you should consider what is the most important feature of a welding helmet to you. There are so many different types of welding helmets available that finding the perfect one for you may be easier than you think. Finding comfortable headgear for your welding needs consist of knowing what you need and what’s important for the type of welding you intend on doing. Taking the time to explore the different types of helmets and their benefits will help you to choose what is right for you. If you are not sure of exactly what you are looking for, you have come to the right place! The Antra Ah6-260 welding helmet appears to be the people’s top pick! 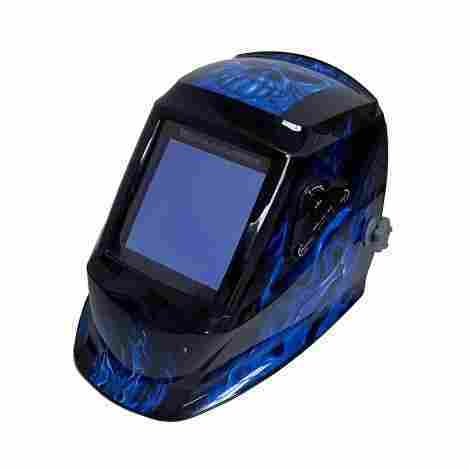 This light weight welding helmet comes with solar power auto darkening, four premium sensors and a grinding feature. The helmet itself is easy to assemble, flexible and it effortlessly fine-tunes to fit its buyer. This helmet is perfect for wearing long periods at a time, worth the cost and would make a great back-up helmet. The helmet allows adjustments for the strap, headband and lower limit. The helmet falls back into the same setting without the hassle of the user having to reset the helmet prior to every use. This helmet is great for both indoor and outdoor use with its adjustable tint feature. Delay and sensitivity settings can be configured without difficulty. Sunlight can trigger auto darkening but the setting can be disabled if necessary. The Antra Ah6-260 gives you more bang for your buck! It is very durable and affordable. Works well with TIG, MIG, MMA and Plasma. The Lincoln Electric 3350 series welding helmet is made of Nylon, Polycarbonate material and comes furnished with auto-darkening, a 4C(TM) Lens and grind mode that is inside the helmet. The Lincoln 3350 series offers 10 different styles of the helmet powered by a replaceable lithium battery. The helmet itself is easy to assemble with crisp, clear and cleaner visuals. In the words of a professional welder, “If you can see better, you can weld better!”. The wide field of view would be considered an asset to the helmet! Being that the helmet is equipped with the latest 4C lens technology, the helmet’s ocular clarity is the absolute best in the industry! The Lincoln 3350’s screens of a wide range of adjustable sensitivities for its user. Ranging from DIN 6-13, making sure you can work in any lighting condition without complications. This welding helmet is a little higher on the price spectrum but is well worth the buy. The visuals on the beauty make the purchase well worth it. The Welding helmet comes with extra lenses, a bandana, decorative stickers, and a bag. This helmet also includes a 3-year warranty. The Jackson Safety 46131 Insight Digital Variable ADF Helmet is ideal for professional welders and serious hobbyist. This helmet is equipped with an adjustable shade range and a wide viewing area for that flawless view. Its light weight and flexible build are perfect for those of you who will be wearing the headgear 10+ hour a day. If you are the type of person to constantly flip your hood up, this is for you! The ADF on this helmet will enable you to work in a variety of different settings. This helmet contains a shade lens with 4 different auto dimming sensors and adjustments for extremely bright work environments. These easy to use digital controls are an upgrade from what you may be used to. Digital display and multifunctioning controls for any welding project you may have in mind. 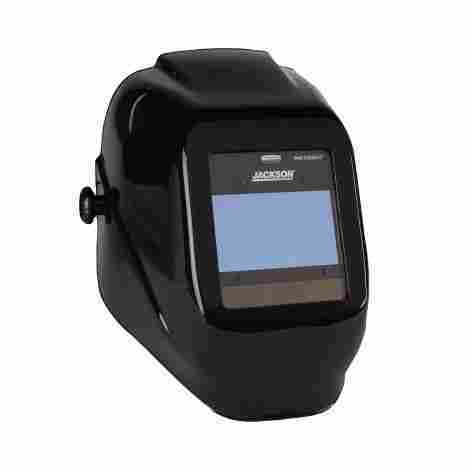 The Jackson Safety Insight Digital ADF welding helmet is averagely priced for the quality of the helmet. This helmet can be compared to the HLX100 and HSL 100 shells. Recommended for Industrial businesses and serious hobbyist for its quality and durability. 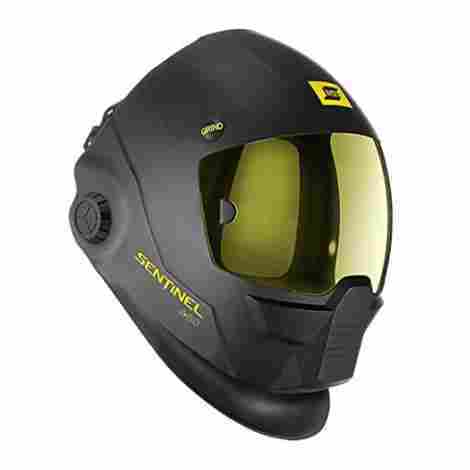 The ESAB Sentinel A50 auto-darkening welding helmet has a revolutionary, streamlined shell design made of a high impact resistant nylon. Its unique design is made with the idea of reducing pressure loads and increasing the comfort of welders who use the helmets for long-term wear. The Sentinel is at the top of the market with all its modern age technology for millennial welders. This streamlined shell helmet serves you with an ergonomically based halo design. It also gives you that adjustability you are looking for with its five-point contact headgear. Perfect for providing extreme comfort and balance. This luxury helmet has an external activated Grind Button and offers Shades 5-9. Its color touch screen control panel is armed with 8 separate memory settings just for your convenience. This helmet sits on the high end of the market. Because of its modern design and hard shell, it offers longevity to its users. It comes with a bandana, padded bag and 6 extra lenses. This helmet is worth the buy to avoid the bulkiness of a larger helmet. 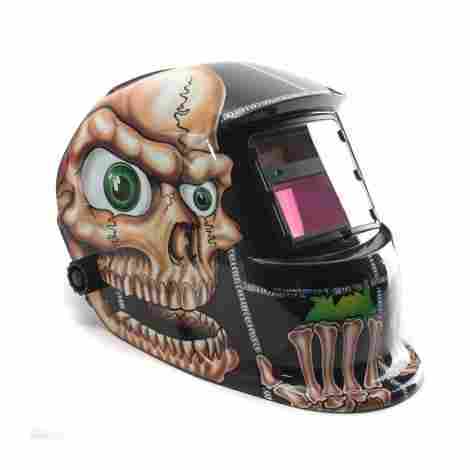 The Instapark ADF Helmet is made for the hobbyist or weekend welder. It has a solar-powered, fully automatic apparatus and has a viewing area of 3.94” x 3.86” which makes it the largest window in its class! Its groundbreaking design gives you all the quirks! It has convenient external controls, adjustments for dark state, sensitivity, and delay. Get this- You don’t even have to take off your helmet to do it! This helmet has a whirlwind of a speed for switching time! It switches from light to dark in 1/30000 of a second! It has been equipped with dual ARC sensors and an automatic sensitivity control. The Instapark ADF Series GX990T has a built-in solar panel for independent recharging! Although it does require a lithium battery pack (which comes included) you get more use out of it if you let it rest in the sunlight! The Instapark Series welding helmet is priced well within range for its capabilities. The helmet is made of light but durable complex material for your comfortability. It does come with a carrying bag and extra lenses. Its internal enhanced protection and reliable performance makes it well worth the bargain! The Hobart 770756 Impact Variable Auto-Darkening Helmet was built precisely for the production floor! It is fully automatic and made of a lightweight but quality polyamide material which makes it durable for long-term wear. This helmet is perfect for industrial welders who are experienced in the industry or for training new welders into expanding their skills. If you plan on working long hours around heavy materials that can fall, this one is definitely worth taking a look at! 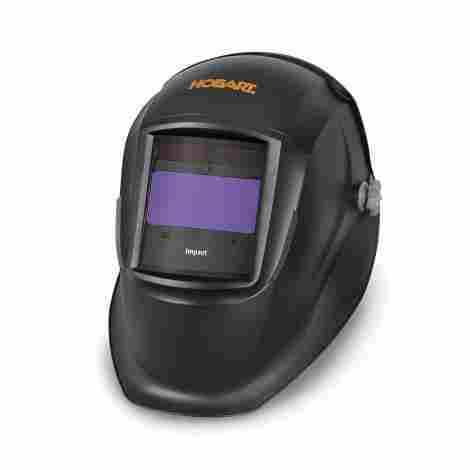 This helmet is perfect for professional welders who prefer to use magnifying cheater lenses. Although they may not be necessary, it is an option. This helmet also includes 5 outside lenses and 2 inside cover lenses. The Hobart 770756 Impact Variable Auto Darkening Helmet has a grind mode that works flawlessly and is as a light enough weight to help reduce neck and shoulder complications. A professional welder could never go wrong for the extremely reasonable price! The Rhino Carbon Fiber RH01 helmet is made of nylon and features a 4" x 2.6" viewing window. This option is made of a lighter material versus a heavier material which can have an awesome design but may lead to fatigue or other strenuous complications. This product is perfect for preventing that neck and shoulder strain! What more could you ask for? Compared to all other helmets, this device has one of the largest view windows in the welding industry. Other helmets have standard view lenses half its size. This helmet is amazingly on the lower end of the price spectrum. This helmet includes ratchet style headgear with a headband, and both a solar panel and replacement batteries. This helmet comes with a 2-year Warranty that covers defects/flaws in manufacturing! 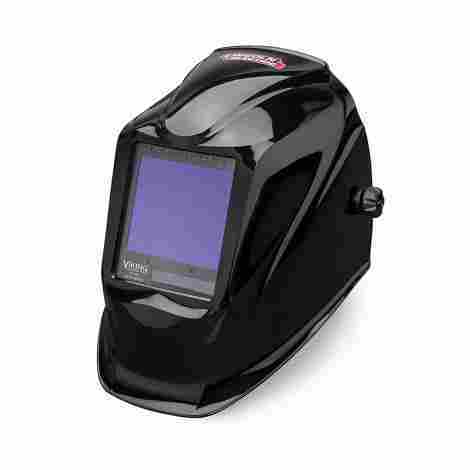 The Antra AH7-860-0000 solar powered helmet is a hobbyist or beginner welder’s dream! 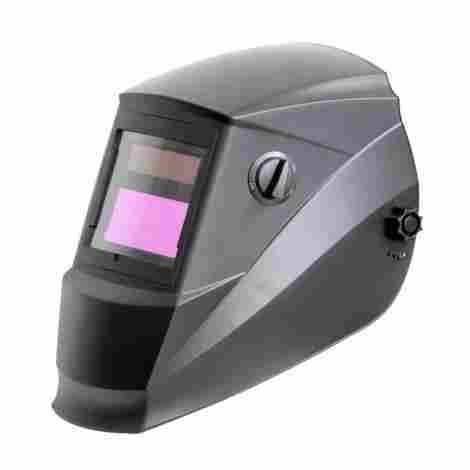 This helmet is a solar powered, fully automatic welding machine great for TIG, MIG, MMA, and Plasma Applications. It comes with a grinding feature, large viewing window and 4 premium sensors. This product has a normal tint so light that you can work without raising your hood! This is a step up from fixed shade glass welding helmets or old auto lens helmets! The Auto Darkening Filter on this is superb! This helmet is equipped with four premium sensors that will darken the viewing lens at all welding angles. The large window gives you a richer view than ordinary and is the perfect upgrade from goggles! Welders will love the viewing window that measures at 3.78” x 3.50". The spacious Antra AH7-860-0000 is a great helmet at an affordable cost and can be used on grinding, cutting and welding applications. If you’re in need of a helmet that allows you to weld with your glasses on, this is it! The 3M Speedglas Welding Helmet is strictly for the Professionals. It has been recommended for those who work in the Construction, Mining, Oil/Gas, Transportation and Manufacturing industries. 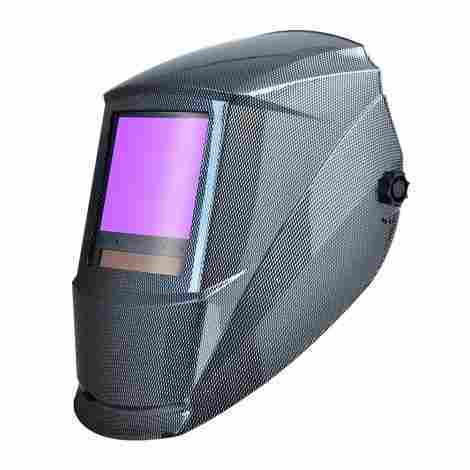 This helmet is equipped with the traditional but reliable welders’ headgear and Auto Darkening Filter. This helmet is perfect for Stick, MIG and most TIG welding processes. It features dark shades 8 through 12, light shade of 3, a viewing area of 6.05 square inches and dual sensors. 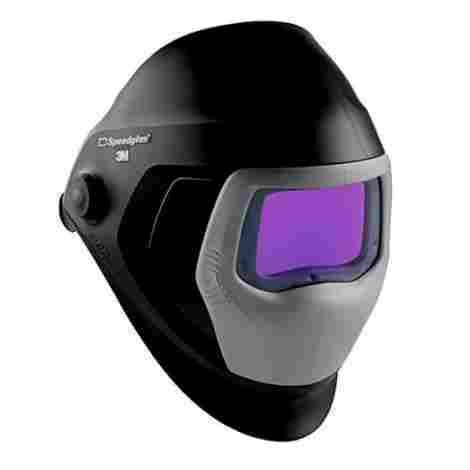 The 3M Speedglas helmet allows room for extra amenities necessary for professional welders. When working in extremely hot or confined areas this is very important. This helmet allows extra room for both eyeglasses and respirators. The make of the 3M Spedglas helmet has been perfected. Its length and width prevent flash burns, being sparked and deflect heat! This helmet is sure to save you a trip to the ER or Doctor’s office. The 3M Speedglas helmet is on the high end of the price wave. It has been built for durability and longevity for the professional welder. It also comes with a 3M Speedglas toolbox label and welding beanie. Industrial businesses will be grateful to have employees equipped with these fine helmets. The helmet is a little heavier than normal; weighing in at 2.71 lbs. The AUDEW solar powered auto darkening helmet was designed to protect the face from welding hazards in harsh conditions. This helmet is essential to welders who are looking to avoid buying extra protective gear. This helmet is suitable for professional welders who are used to high welding operation temperatures. The build of the AUDEW was unquestionably made with professional welders in mind. 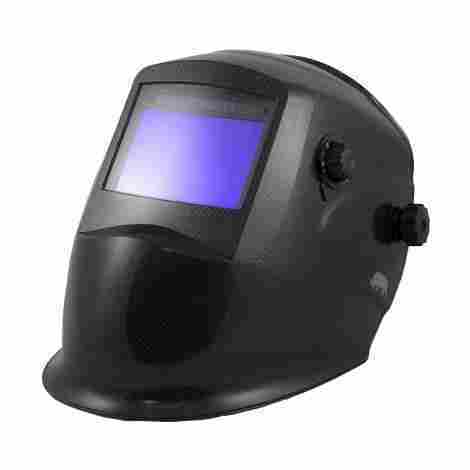 This Auto-Darkening welding helmet protects the eyes and face from harmful radiation under normal welding conditions. The AUDEW has an auto darkening lens that will instantaneously darken when it detects light from from the welder. Great visibility! The AUDEW is actual a cool looking helmet if skulls or skeleton graphics is your thing! Its pretty low on the price side but well worth the buy. The helmet doesn’t come with a battery pack but for the price, purchasing a battery pack will not be an issue. Finding the right welding helmet is just the icing on the cake when it comes to welding. Making the choice to purchase a welding helmet is a very delicate decision-making process. You must be aware of what type of welding projects you will be doing prior to the purchase. Maybe you will be doing hobby or weekend welding at home, or maybe you have a job working in an extremely hot facility. As a hobbyist you may decide to do your welding outside or in an open-door garage. Safety: The American National Standards Institute has set certain safety standards for protective gear. Keeping in compliance with safety standards is also vital to choosing your welding gear. Working in the industrial side of welding requires you to have multi-functioning helmets that can withstand high heat, protect you from flash burns, sparks, and burns to the face, neck and chest area. There are other things you must take into consideration before purchase like knowing your welding lingo, the parts of the helmet, how to avoid accidents and how to prevent injuries. Capabilities: The size of your viewing window, the tints of shade and the power source of your welding helmet are all important. Whether you are a professional or a hobbyist, the style of helmet you choose should be capable of functioning on a level that you can comfortably perform on. Some of the helmets are digital, and that can be nice. Although it is harder to set your adjustments via touch screen if you keep your gloves on. If you are working with the helmet for a long period of time, solar powered may be the best option. But if you decide that you will only be working with it here and there, maybe battery operated is just right for you. Headgear: The headgear beneath the shell of your helmet is the most important factor. It should fit snuggly around your head and be able to hold the weight of the hood. There are different types of headgear that can be purchased based on your preference of material. Product manufacturers can always provide detailed information on the headgear you choose, give product reviews and show you what accessories are available for the helmet you choose to make it your own. Auto-Darkening: The auto darkening feature is an upgrade from older helmets. This allows your lens to adjust shades based on the brightness of your environment. Whether you are inside or outside, or the UV/IR rays are severely bright, the lens will adapt. With the auto darkening feature, the helmet must be present prior to use by sitting it out in the sun for approximately four hours. This allows the helmet to adjust itself to normal lighting and will be able to tint in range based on the normal setting. Viewing Window: The welding helmet that you choose should always have a viewing window large enough for you to be able to see your project thoroughly. If you are welding larger projects, you want to make sure your viewing lens is large enough to see the whole project as clear as possible. Accessories like magnifying lenses (cheater lenses) and colored lenses are available if you need them. Not being able to see your project could lead to accidents and injuries unforeseen. Always make sure that your range is at its best before starting to weld. Price: The price range of welding helmets can become expensive depending on the material it is made from and the technology implemented. Some of the helmets are made light with delicate materials and are made to last longer hours. These helmets may have to be replaced annually if they are used for longer time periods. Most helmets are priced for light welding. If you are partaking in industrial welding, you want to make sure you spend the extra money for durability, longevity, longer lasting charge life, and that larger viewing window. Q. What should I look for when purchasing a welding helmet? A. The helmet of choice should be light weight and meet the ANSI Z87.1 industry standard. Having a lighter helmet will lessen the strain on both the neck and shoulders for the industrial or day to day welder. Professional welders will tell you that the variance between a 1 lb. helmet and a 2 lb. helmet makes a big difference over a long period of time. As a welder, you will be exposed to both highly concentrated Ultraviolet rays and Infrared rays. It is vital to have head gear that can protect your eyes, face and neck from probable hazards such as heat, sparks and possible flash burns. Q. What is a flash burn? A. A flash burn is a serious injury that takes place when a person is exposed to ultraviolet light without proper eye protection. When using a welding torch, the UV rays are so bright that if the cornea of the eye is exposed, it can cause painful inflammation. The cornea of the eye is extremely sensitive and will require special prescription eyedrops or an antibiotic ointment for treatment. Q. Why is wearing a welding helmet necessary? A. Any time a person decides they are going to be doing any type of welding project, a helmet is required. When welding, it is necessary to prevent arc eye, flash burns or any other serious injury that can be caused by either the ultraviolet rays, infrared rays or sparks that may fly off the materials being welded together. Unprotected exposure could lead to serious eye, face or neck injuries. Q. What is Arc Eye? A. Arc eye is best described as a sunburn to the cornea of the eye. Symptoms include redness, swelling of the eyelids, headaches, a feeling of pain or irritation to the eye. Some people have compared it to the feeling of having sand in the eye. Vision is temporarily distorted and will usually return after 18 hours. The cornea of the eye will heal anywhere between 24 to 48 hours after the injury takes place after being treated professionally with antibiotics. Q. What is the general standard for a welder’s helmet? A. With welder’s helmets, the general standard is set by the American National Standards Institute. The current standard is ANSI Z87.1 which basically states that all protective eyewear requires auto-darkening features to provide full protection against both Ultraviolet rays and Infrared rays even when the helmet is in the darkened state. Although the standard is deemed voluntary, every buyer should make sure their helmet meets compliance standards for their use; especially if they will be using the helmet in an industrial environment. Q. How do I properly set an Auto Darkening helmet? A. Setting the auto darkening feature on your helmet is a delicate procedure. After you have properly secured the helmet, swing it over the headband on an even surface. Once the helmet has been set, adjust the shield’s delay time. Setting the delay time is simply setting the amount of time it takes for your helmet’s shield to switch from its darkened state to its lightened state. Depending on your helmet choice, the switch may be inside or outside of the helmet. Using the adjustment knob, usually on the left side of the helmet, set the intensity of darkness to your preference based on the type of welding you will be doing. You should always check for the darkest shade recommended for the type of welding you will be demonstrating. Q. What is the difference between a battery powered welding hood and a solar powered welding hood? A. All welding helmets must have some form of power to function rather it is battery operated system or powered by sunlight with a solar panel. With battery operated helmets, t can get expensive replacing the helmet especially if you will be using it for long periods of time daily. There are helmets that are battery powered that are equipped with solar panels that will recharge the batteries for you. Those really come in handy. Then there are those helmets that solely rely on the sunlight for a power source. In those cases, you may have to sit the helmet out in the sun for the recommended amount of time for it to fully charge. Q. What kind of problems may arise from wearing a heavier welding helmet? A. Professional welders recommend that anyone looking for a helmet should consider three things: comfort, consistence and compliance. Just because a helmet looks amazing doesn’t mean that it is ergonomically good for your body. The helmets can be heavy, hot or even wear you down physically. Whether the helmet is in the up or down position, or even if you’re leaning forward, it adds additional stress to the neck and back regions. To avoid neck and back pain, choose a helmet with headgear that fits comfortably, performs exceptionally and is lightweight. Q. How important is the size of the viewing lens on the welding helmet? A. Depending on the size of what you’re welding, you want to make sure you have full range of view. For larger projects, you want to make sure to be able to see more than just straight forward because of accidents they may occur out of the range of your eyesight (blind spots). The average size for a viewing lens is 6 square inches for light duty. For industrial lenses, they are usually about 9 square inches. Out-of-position welding must be considered when purchasing a helmet with appropriate lens window sizing. Q. What is Ratchet headgear and why is it necessary? A. Ratchet Headgear is usually made of a high-strength plastic that fits like a crown on the head attached to the face shield. It secures the hood so that it doesn’t move while welding. In combination with the hood, it is used to protect the face and neck from serious injuries that can take place from sparks or UV.IR rays. If your welding helmet comes with a five-position crown strap, it can be customized for comfortability. Head protection with the ratchet headgear is recommended for workers in metalworking, woodworking, utilities, just to name a few. Q. What are the different types of welding and how will I know which helmet is best suitable? A. There are numerous types of welding that can be done. There are TIG (Tungsten Inert Gas), MIG (Metal Inert Gas), Arc welding and Gas welding. It depends on the type you will be performing as to which helmet is required. You also must take into consideration the angle at which you will be welding for ultimate protection. Most welders prefer to weld down hand, vertical up or vertical down. If you will be welding overhead, you want to make sure your headgear has enough protection for your shoulders and back of your head in addition to the helmet. Q. Do all battery powered helmets come with the battery pack? A. It depends on the helmet that you purchase as to what you may need to buy additionally. Some helmets that are battery operated may come with the battery already installed. If not, you will have to purchase the battery separately. You will need to check the battery life before purchase so that you will know how long it will be before you must purchase another. Having a battery-operated helmet comes with the risk of your helmet shutting down mid-weld. Q. What are some of the accessories I may need in addition to a welding helmet? A. It depends on the type of welding you will be performing. You may be interested in purchasing a bandana, do-rag or beanie to wear under the ratcheting head gear. You may also consider purchasing helmet bibs, or throat and side protectors for helmets with shorter hoods.